Like any good Eltie, I like a lot of Elton John’s slower songs. “Your Song” practically makes me tear up, and that “Tiny Dancer” scene in Almost Famous? Forget about it. Listening to the new, remastered, 40th-anniversary edition of Goodbye Yellow Brick Road reminded me that, while John does schlock well, he also wasn’t always afraid to turn out a real rock ’n’ roller. What’s great about 1973 John, though, is that he can take on all manner of personas. 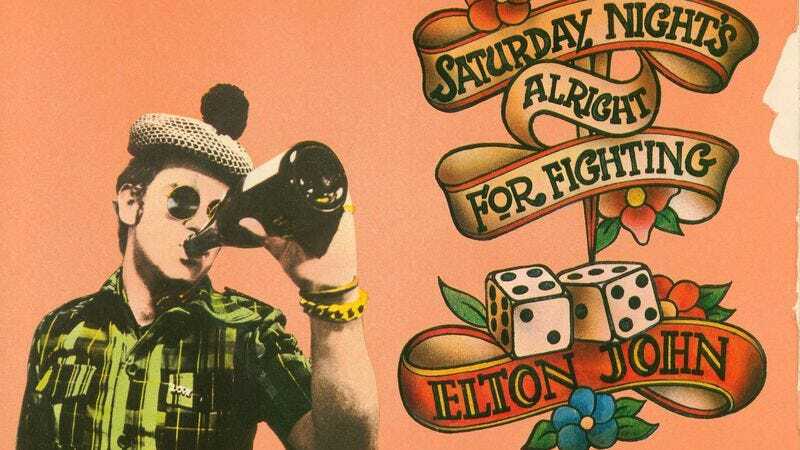 Goodbye Yellow Brick Road was released just as the singer sort of fell off the wagon, favoring costuming and showmanship over actual songwriting, but “Saturday Night’s Alright” is a perfect blend of the two: It’s John playing a role, acting out, and putting out an excellent song all in one fell swoop.